These homemade cookies have the best of everything - part chocolate chip cookie, part double chocolate chunk cookie. There's something for everyone in our Chocolate Duo cookie recipe. Beat butter and sugars in large bowl with mixer until blended. Add eggs, 1 at a time, mixing on low speed after each just until blended. Combine flour and baking soda; gradually beat into butter mixture. Divide dough in half; place in separate bowls. Add melted chocolate to dough in one bowl; mix well. Stir in white chocolate pieces and nuts. Stir chocolate chips into dough in second bowl. For each cookie, drop 1 tsp. of each dough, side by side, onto baking sheets, leaving 2 inches between cookies. Bake 8 to 10 min. or until lightly browned. Cool on baking sheet 3 min. Remove to wire racks; cool completely. 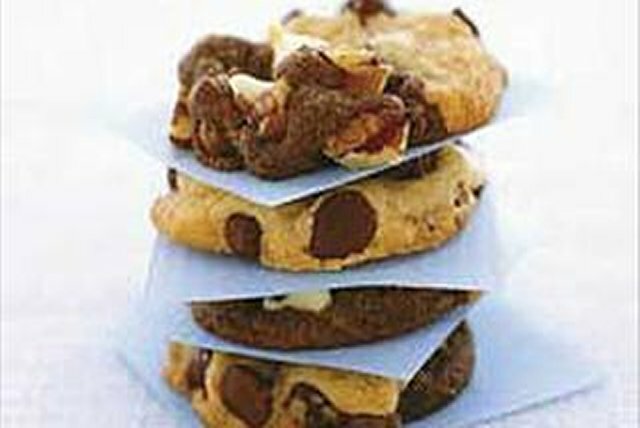 This recipe is equally yummy when each dough is baked separately as single-flavour cookies.